LONDON, UK — All eyes were turned to London on July 27, for the opening ceremony of the London 2012 Olympics. With 16,000 athletes from 204 countries and over 11 million visitors, the audience watched in awe as they walked through the history and culture of the United Kingdom in a three-hour showcase. Taking advantage of being in the host city of the Olympics, the Korean Cultural Centre UK (KCCUK) has set out to grab the attention of Londoners and Olympic travelers by launching a 100-day summer festival entitled All Eyes on Korea. 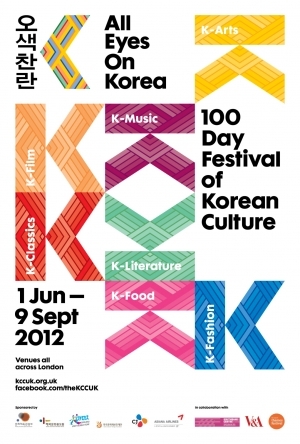 From June 1 to September 9, 2012, the cultural campaign will present an extensive series of cultural and entertainment programs throughout London to showcase modern and traditional Korean culture. To date, Korean culture has mostly garnered international recognition for its pop music (K-pop) and television dramas (K-drama). To introduce and spread interest in diverse aspects of Korean culture and arts, the Korean Culture and Information Service (KOCIS) and KCCUK have organized programs under the categories of K-Arts, K-Music, K-Classics, K-Literature, K-Film, K-Fashion, K-Lecture, K-Food, and K-Culture. On June 1, Korean installation artist Choi Jeong-hwa kicked off the All Eyes on Korea festival with the exhibition Time after Time. With the help of local supporters and volunteers, Choi covered 16 concrete columns of the Hayward Gallery balcony with over 5,000 green plastic baskets instilling life and fun in the gray building. Time after Time will run until September 9, along with Life Life, Choi’s other exhibition that places 20,000 colored balloons in the trees around the Hungerford Bridge. Another Korean artist, Kim Beom, is holding an exhibition entitled The School of Inversion at the same gallery. Kim uses a variety of media including drawings, video, and sculptural installations to turn the conventional norms of a classroom upside down, making visitors reflect on their perceptions of a classroom. The display will continue until September 2 as part of the Southbank Centre’s Festival of the World. Korean artist Lee Bul also gave a lecture at the Hayward Gallery by participating as a teacher at Southbank Center’s Wide Open School, which is an unusual experiment in learning. From June 11 to July 22, the gallery became a temporary summer school in which 100 artists from 40 different countries facilitated workshops, collaborative projects, lectures, and performances about subjects they were passionate about. On June 15, Lee gave a 90-minute lecture about her work processes and major projects displayed at her recent exhibition at the Mori Art Museum in Tokyo. The lecture was very well received by art lovers and professionals alike. The KCCUK is also running its own exhibition, Korean Funerary Figures: Companions for the Journey to the Other World. The exhibition showcases a traditional funeral bier along with wooden figures of a variety of people, including clowns, noblemen, and mythological creatures, each of which serve as decorations for a funeral bier. At the exhibition, visitors will be able to explore the unique aspects of Korean folklore. The exhibition will continue until September 9. The traditional music group Be-Being presented a concert at the Queen Elizabeth Hall in the Southbank Center on July 23. Entitled Yi-myun-gong-jak , Be-Being’s mask music project was inspired by the long history of Korean masks and their cultural aspects. The concert consisted of traditional Korean music of both original compositions and reinterpretations of various traditional Korean mask plays. The title of the concert, Yi-myun-gong-jak, is a Korean expression that originally refers to an activity or action behind the scenes or wire-pulling in the background, which in this concert alludes to the symbolism of masks and the masquerades they offer in the context of traditional Korean mask plays. There was also a pansori concert at the Queen Elizabeth Hall on July 30. Pansori is a genre of traditional Korean music (gugak) that features a vocalist who sings and chants a story accompanied by a percussionist and is officially recognized by UNESCO as an important piece of world culture. A group of performers, Pansori Project ZA, staged Pansori Brecht Sacheon-Ga, a work of modern pansori imbued with romantic love and satire. Its narrative style incorporates modern dramatic elements. On July 28, the K-Music festival featured another work of traditional Korean music with a contemporary twist through the concert Walkabout rendered by fusion gugak group GongMyoung at the Purcell Room of the Queen Elizabeth Hall. The quartet played 30 types of instruments in this performance. Creating their own instruments specific to each desired sound, the group blends melody and rhythms with the power of Korean drums and the delicacy of their percussion. On 12th July, passionate volunteers gathered at the Korean Cultural Centre UK to promote our 100 Days Festival. They sang and danced the most recent K-pop songs and shouted Dae-han-min-guk along the streets of central London (photo courtesy of KCCUK). From June 26 to July 1, Kim Hyesoon shared Korean literature with the public at the United Kingdom’s largest ever poetry festival Poetry Parnassus. With poets from each competing Olympic nation participating, Kim recited poems including “All the Garbage of the World, Unite!” and “Seoul, Korea” in Korean followed by English translation. Kim is said to be one of the most important contemporary poets of Korea and was one of the first women to be published in a literary journal in Korea. The festival also promotes Korean films by screening movies at the KCCUK. and inviting film directors to attend the screenings and have a Q&A session. The Korean filmmakers featured first included Lee Jun-Ik of Battlefield Heroes and Lee Hyun-seung of Hindsight. Director Lee Yoon-ki of Come Rain, Come Shine and Jeon Kyu-hwang of Varanasi will visit London on August 30 and September 27 respectively to attend each movie’s screening and answer audience questions. On August 2, the KCCUK will screen Crossroads of Youth, South Korea’s oldest surviving black-and-white silent movie, which will be accompanied by a narrator and live orchestra. The audience will be able to experience the film just as Korean audiences did when it was premiered in 1934. On July 30, the gala reception Korean Shining Bright showcased the latest collections of Korean fashion designer Lie Sang Bong on the special runway of the Victoria and Albert Museum. The 300 invitees were mesmerized by the colorful prints and intricate construction designs, which were inspired by a classic Korean architectural element called dancheong (the traditional multicolored paint of Korean royal palaces). Korean culture supporters who attended a 12-week K-pop academy course at the KCCUK were dressed in T-shirts designed by Lie Sang Bong while visiting major tourist attractions in London to promote the All Eyes on Korea events. The KCCUK also hosted a series of lectures on topics ranging from Korean cuisine to Korean literature to Korean music. On July 18, Ralph Rugoff, the director of the Hayward Gallery, shared his experiences in curating contemporary art and Korean artists. On July 18, an introduction to easy Korean dishes such as rice cakes and drinks was demonstrated by Master Chef Tony Yoo. On July 20, Professors Keith Howard from SOAS, the University of London, and Professor Nathan Hasselink from the University of British Columbia lectured on the traditions, innovation, and identity of Korean music. The All Eyes on Korea festival will draw to a close with an outdoor event at the 2012 Mayor’s Thames Festival on September 8-9. The event will stage comedy shows and display pieces of contemporary arts and crafts, a wide selection of food tasting stands, and live artist workshops in front of the Tate Modern, an art gallery in London. It will also showcase a traditional Korean wedding ceremony. To browse the list of All Eyes on Korea events and to find out which ones to get involved in, please visit the official website of the KCCUK.